It’s the mission that drives all of us towards a common goal. Capital Safety is the global leader of fall protection, confined space and rescue equipment, with a passionate commitment to quality, innovation and safety. With more patents, more engineers and more industry innovations than any other fall protection manufacturer, it’s no wonder that Capital Safety and its brands are the most recognized and trusted around the globe. The minds behind our thousands of products come from nearly as many fields of expertise. Whether your interest is in engineering, supply chain, marketing, finance, sales—or any number of other areas—you can find your path to professional fulfillment at Capital Safety. 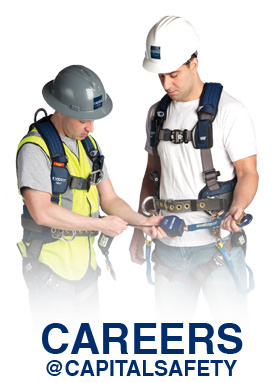 We invite you to check out our Careers pages and get started now!